Steve Phillips wrote in Political Intelligence, May 17, 2013. The other intriguing race is in Georgia where the incumbent Republican Saxby Chambliss is retiring, thereby creating an opening in a state that is 45% people of color and where Obama got nearly 46% of the vote without even contesting the state. Michelle Nunn, daughter of former Georgia Senator Sam Nunn, is looking carefully at the race and if she gets in, things could get very interesting. Nunn could galvanize support from women across the country (two years before a potential Hillary run for President), helping her raise the resources to mount a competitive race. Most importantly from a strategic standpoint, a competitive Georgia statewide race could provide invaluable hands-on training to hundreds of activists and operatives who could then provide the infrastructure for contesting the Presidential race in 2016 and the Governor’s race in 2018. For example, PAC+ Board member Stacey Abrams recruited a team of 75 young organizers to work in last year’s races, and that network could be deployed, expanded, and further developed by working on Nunn’s campaign. This is a race to watch. Contrary to popular belief, Georgia's tipping point is not in 2020 but in 2014. 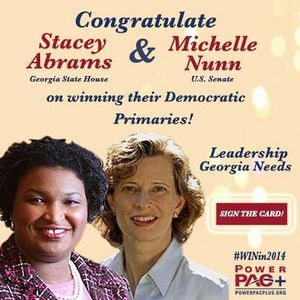 Stacey and Georgia Democrats have plans laid out to chip away the Georgia Republican supermajority starting with Michelle Nunn running for U.S. Senate. Michelle Nunn, the former CEO of Points of Light Foundation, the largest volunteer service organization in the country, is the Democrat’s best chance to maintain their majority in the U.S. Senate. In addition, Michelle’s Senate race will be a chance for Democrats to harness the growing multiracial voter majority in Georgia to secure a win for Georgia Democrats. Georgia Democrats want to basically turn their state into the next Virginia, where People of Color can elect Democrats into office. PowerPAC+ believes it can be done. As PowerPAC+ Senior Advisor, Kirk Clay tells our team in a recent Political Intelligence blog “Black Voters Can Save the Senate," Democrats need to replace “the decline of white progressive voters with a surge of voters of color.” Clay goes on to say that “[Georgia Democrats] can’t allow African American voter turnout to drop 3-5% [if they expect win in November].” If Democrats can turnout voters of color and pull in maybe 30 or 31 percent of whites, they can elect Nunn into office. This page was last modified on 9 July 2018, at 00:02.